The National Optical 109-LED is a popular elementary student microscopes!! This microscope is scaled down in size for younger users and has precision quality glass optics. 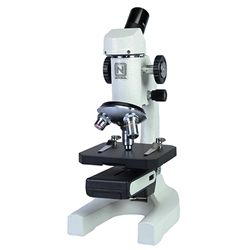 Includes rugged metal components and student proofing features to eliminate damage to microscope and loss of parts. Objective Lenses: Achromatic, color-coded 4x, 10x, and 40xR objectives mounted on precision revolving objective turret. 45° inclined head for ease of viewing when seated. Head rotates 360°. Eyepieces: Widefield 10x eyepiece with revolving pointer. Specimen Stage: 88mm x 82mm stage (3.5" x 3.25") with locked-on spring activated stage clips. Disc diaphragm. Focusing: Rack and pinion focusing, coarse and fine focusing knobs. Slip clutch prevents damage to focus mechanism. Rack stop protects objectives and specimen slides. Illumination: Cordless microscope, LED Illumination, includes rechargeable NiMH batteries, auto cutoff recharger and on/off switch with rheostat control. Size & Weight: 11.75" high, 4 7/16" wide, 6 1/4" deep, 3.7 lbs.